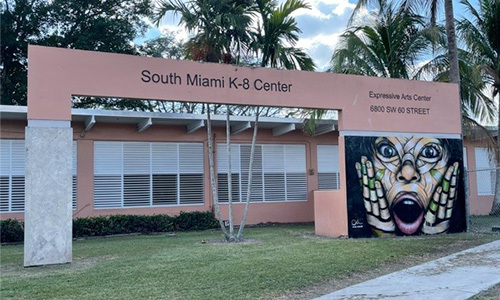 Welcome to South Miami Elementary Expressive Arts Center. We are a magnet school for the arts providing art, music, dance and drama instruction for eligible students in grades 3 - 5. Out total school population includes children from Prekindergarten through grade 5. We are located at 6800 S.W. 60 Street, in South Miami, Florida. Academic excellence is our number one goal. We live by our motto: "Raise your spirits and soar like eagles!" I believe that educational excellence will enable people to lead an intelligent life. Mastery of reading, writing, and mathematics is essential to this goal. Reading, writing, and math open the door to understand and achieve in history, sociology, science, economics, and the performing and visual arts. In addition, educational excellence must produce thinking, feeling and morally sound citizens of the world.